The 2017 Nissan Rogue Sport SL AWD Review: Crossover vehicles are so popular right now that car companies are apparently dumping them into a food processor to slice and dice them into tiny segments. The latest sliver? Nissan has chopped its fast-selling Rogue into a new variant, the Rogue Sport. Just looking at the two in pictures, I struggle to tell the difference. They both have Nissan’s familiar crossover face and the slightly rakish roofline that’s so in vogue right now. Pull out your measuring tape and the differences become clear. The Sport’s wheelbase is about 2 inches shorter, and its overall length is over a foot shorter than the ordinary Rogue, Nissan’s top-selling vehicle. That means there are some drawbacks but also some advantages. On the plus side, the Rogue Sport is more maneuverable and easier to whip into tight parking spaces than the bigger Rogue. It feels like a good fit for urban drivers, singles or young couples who don’t need the extra cargo space and heft that bigger crossovers often require. On the other hand, you lose some of the attributes that make the Rogue so popular and versatile: its third-row seat and ample cargo area. In the Rogue, putting the third-row seat in place means you’re left with a paltry 9.4 cubic feet of cargo space. But at least you have the option to fold that back seat down to expand the volume to a generous 32 cubic feet. Fold both the second and third rows flat, and you’re left with an SUV-like 70 cubic feet of space for hauling your stuff. In comparison, the Rogue Sport has 22.9 cubic feet with the second-row seat up and 61.1 with it stowed away. Power is similarly chopped for the Rogue Sport, all the way down to 141 horsepower compared to 170 in its bigger cousin. You can definitely feel the difference when you step on the gas pedal, but you won’t see a huge benefit at the pump. The Rogue Sport gets a government rating of 25 mpg in the city and 32 on the highway, just a 1-mpg improvement over the Rogue. Given the 20-percent power deficit, I’d hope for better numbers than that. Nissan’s designers use what they call a “gliding wing” motif to give it a symmetrical, visually cohesive look that makes it feel roomy and modern from the front seats. As a whole, though, it checks a lot of the boxes that contemporary buyers are looking for: sporty styling, more versatility than a small sedan, good gas mileage and well-designed technology for safety and connecting smartphones. It comes standard with Siri EyesFree, and a suite of advanced safety features, adaptive cruise control, lane departure warning and prevention, and automatic emergency braking with pedestrian detection, can be added for an extra charge. Those cost a total of $570 as part of the Platinum package on my SL-grade tester. The Bottom Line: The 2017 Nissan Rogue Sport is a new variant of the Rogue, called the Rogue Sport, and it’s more than a foot shorter in length than the popular Nissan. Inside, it feels more spacious than its compact dimensions would suggest. 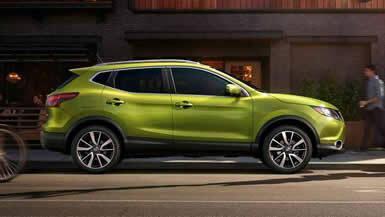 On the outside, the Rogue Sport looks every bit an athletic, sophisticated crossover. Nissan’s “gliding wing” design gives the Rogue Sport’s cabin a symmetrical, roomy appearance. Pricing starts at $21,420 for the Rouge Sport, which is $2,400 less than the bigger Rogue.